Our Awning Has it, Will Yours? Extruded Arm Shoulder Pitch Adjuster with tripe stainless bolts is drop forged for strength and durability. All Aristocrat Awnings are Custom Made and Professionally Measured and installed by a Suburban Construction specialist. Aristocrat Awnings from Craft-Bilt Manufacturing Company are custom built in to your specifications. 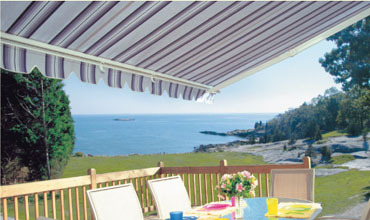 Suburban will visit your home or place of business and help you decide the best placement for your awnings. They will check the available mounting height, and recommend the best styles for your application. Working with your home’s décor, your corporate colors or building architecture, they can help you locate the fabric that will complement your image and make your home or building stand out from the rest! 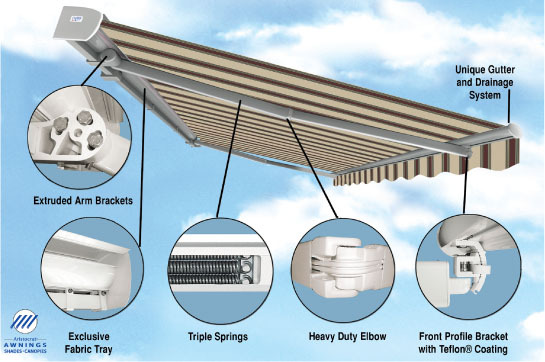 Depending on the awning you choose, you can add optional equipment to operate your awning automatically, and extruded aluminum covers to protect your awning fabric from the elements. Finally, select from our standard valance designs - or create your own. When we send this information at the Aristocrat factory, they cut, sew and build your awning for you. If you have ordered more than one awning, they will make them from the same bolt of fabric for color constancy. Add to your healthy lifestyle by reducing your threat of skin cancer; a fabric awning decreases your exposure to the sun's harmful UV rays. Please enter the number 18455 in the box provided below.